After more than six decades of fighting the spread of trachoma in Morocco, on November 14, 2016, the World Health Organization (WHO) acknowledged that the Moroccan government eliminated the world’s leading infectious cause of blindness as a public health problem. Pfizer's antibiotic donation, in partnership with the International Trachoma Initiative (ITI), as well as the implementation of the WHO-recommended SAFE strategy (Surgery to treat the blinding stage of the disease, known as trichiasis, Antibiotics to clear infection, Facial cleanliness, Environmental improvement including better access to water and sanitation to help reduce transmission), played pivotal roles in accelerating Morocco’s ability to reach this milestone. 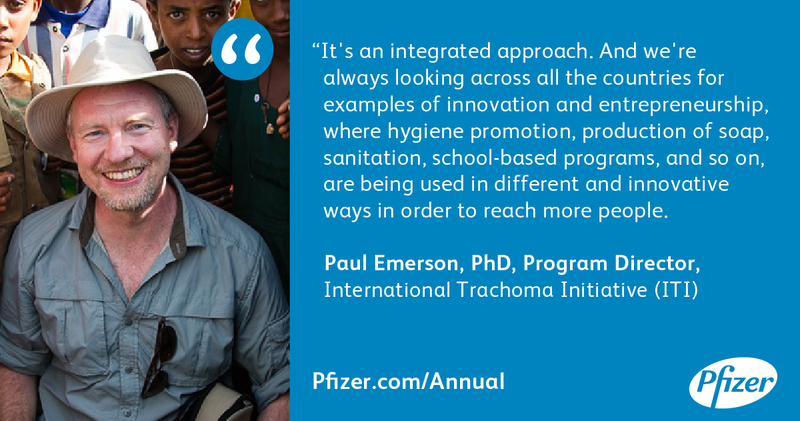 Nearly a decade ago, Pfizer made the decision to support the ITI in its bold goal to eliminate trachoma. Founded in 1998 with a grant from Pfizer and the Edna McConnell Clark Foundation, the ITI, part of the Task Force for Global Health, an independent not-for-profit, aims to meet the WHO’s call to eliminate trachoma by 2020. Since the partnership was formed, this initiative has treated more than 100 million people in 33 countries. The watershed milestone of elimination of trachoma in Morocco is a true demonstration of how social entrepreneurship and partnership can work together to speed improvement of the health of individuals worldwide. It is our hope that this holistic approach can serve as a blueprint for the elimination of other deadly diseases in the future. Learn more about Pfizer’s efforts to eliminate trachoma in the developing world by visiting: www.pfizer.com/annual.